Questions of Fact in NYC Slip and Fall Will Have to be Resolved at Trial - Leandros A. Vrionedes, P.C. A 2010 slip and fall at Tillman’s Bar & Lounge in the Chelsea district on the West Side of Manhattan has raised enough questions of fact that the judge denied both sides’ motions for summary judgment, indicating there are issues for the jury to decide at trial. The plaintiff in Tassini v. L & I Lounge, LLC was walking downstairs from the dining area at Tillman’s to the restrooms and kitchen area below, when she slipped on a wet stair at the top and tumbled to the bottom. In the personal injury lawsuit filed against the restaurant, the defendant filed a summary judgment motion to dismiss the complaint, while the plaintiff filed a cross-motion for summary judgment to have the judge rule in her favor on the issue of liability. The judge decided neither party made a strong enough case that it was entitled to judgment as a matter of law without first having a trial on the facts. Under New York premises liability law, a landowner or person in possession of the property has a duty to keep the premises reasonably safe. The plaintiff in a slip and fall case has the burden of proving that the defendant either created the dangerous condition or had actual or constructive notice of it. To prove the defendant had constructive notice, the danger must be visible and apparent and exist for a sufficient amount of time to allow the property owner to discover it and fix it before somebody gets hurt. Based on the testimony of the plaintiff and defendant, it is clear that the stairs are the passage by which food and drink are brought to and from the kitchen and dining area by the staff. It is also a fact that customers may carry their drinks with them up and down the stairs when going to the bathroom. The plaintiff claimed the defendant had constructive notice because it had no set schedule for inspecting the steps, but she offered no evidence that an employee caused the spill or how long the condition existed. Meanwhile, the restaurant’s manager claimed that the stairs were inspected several times a day and that they had a policy to maintain cleanliness, but he could offer no specifics about the stairs on the day in question. 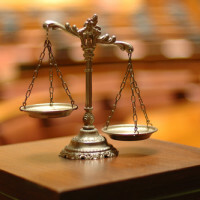 A judge grants a summary judgment motion when there are no genuine issues of material fact to be decided, so there is no need to have a trial on the issues. Here, there are plenty of questions of fact, such as whether the slippery substance was caused by staff or a patron, and whether spills on the stairs are a recurring condition so that the defendant should be charged with constructive notice. The judge denied both parties’ motions, so these issues can be decided by a jury based on the evidence and testimony presented at trial.